Phillip Norris was born in the year 2341 to a pair of Starfleet officers in San Francisco, Ca. To the surprise of no one he enrolled at Starfleet Academy at the age of eighteen majoring in starship operations minoring in engineering. While at the Academy Phillip met the man he would marry during their post graduation leave. They both were assigned to the Galaxy together along with the four month old little girl they adopted. On the Galaxy is where everything began to fall apart. Phillip's husband Leo was promoted in 2365 and transferred off the Galaxy a few months later to be the Assistant Chief Operations Officer. 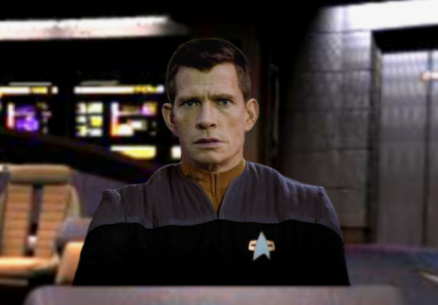 By the time Phillip was promoted to Lieutenant junior grade in 2368 Leo was the Chief Operations Officer on the Odyssey and a full Lieutenant. Their marriage fell apart by the time Leo got to the Odyssey and he had custody of their daughter, Lilly, full time. Lilly was visiting Phillip on the Galaxy when the Odyssey was destroyed in the Gamma Quadrant by the Jem Hadar. When Phillip was offered the Assistant Chief Operations position on the newly launched Bellerophon he had to send Lilly back to Earth to live with his parents since he couldn't bring his family onto an Intrepid class ship. After three years on the Bellerophon he was then transferred to the Galaxy class USS Challenger to be the Chief Operations Officer. Shortly after his arrival on the Challenger Lilly, now ten, joined him on the ship. During his time on the Galaxy Phillip began to see the writing on the wall. He would likely never get promoted past Lieutenant Commander and there were no Second Officer positions being offered to him. Dealing with his stalling career and a rebellious teenage daughter became to much for Phillip. At fourteen years of age Lilly got pregnant and was sent back to Earth to live with Phillip's parents. Shortly after Lilly left Phillip got what many called a pity promotion to Lieutenant Commander. In Nov 2379 after a long talk with Lilly and his parents Phillip applied for and was accepted to transfer to the Planck to be the Chief Operations Officer as part of Project Full Circle. Shortly after arriving in the Delta Quadrant Selor was transferred to the Curie to be First Officer and Phillip was named Second Officer giving Phillip the opportunity he likely never would have gotten in the Alpha Quadrant.